Late R wave transition occurs when the isoelectric chest lead is later than V4. This is also known as poor R wave progression or Clockwise Rotation. Signs of this pattern include if there isn’t a 3mm R wave by V3 or there is still a residual S wave in V6. This ECG is from a man in his 60s who presented with central chest pain that started while mowing the lawn, associated with diaphoresis, nausea and vomiting, on a background of hypertension and previous infarction. 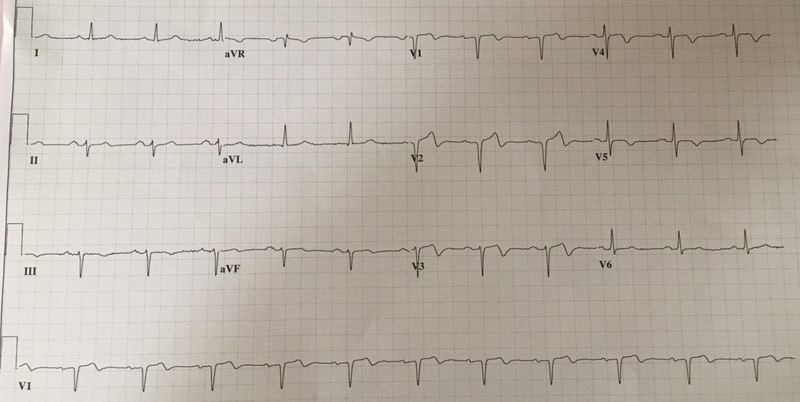 This ECG is from a man in his 60s who presented with central chest pain that started while mowing the lawn, associated with diaphoresis, nausea and vomiting, on a background of hypertension and previous infarction. This was his prior ECG on file for comparison. This ECG is from a woman in her 60s who presented with chest pain and feeling clammy, on a background of hypertension and high cholesterol. This was her first prehospital ECG. This ECG is from a man in his 40s who had a cardiac arrest out of hospital. He regained cardiac output on the way to the Emergency Department. ECG Interpretation Review #142 (Ischemia – MI – Posterior – Dating Infarction – Chest Pain).